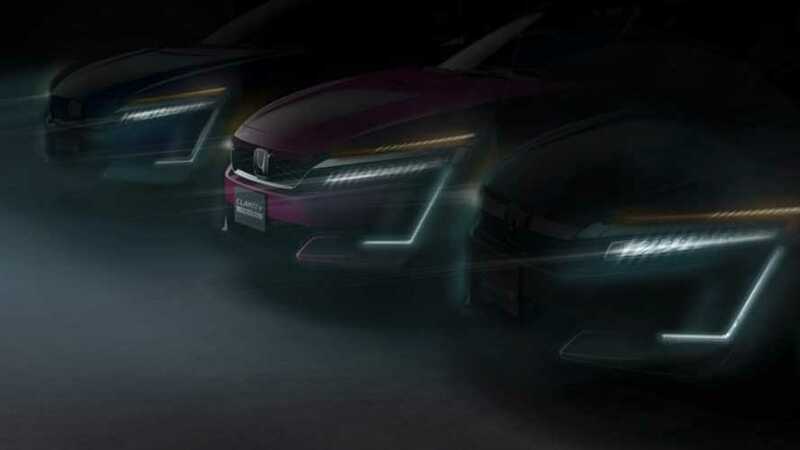 Honda has just released a lone teaser image that contains our first look at the upcoming both the Clarity Electric and Clarity Plug-In Hybrid, as well as the already available Honda Clarity FCEV (center of image). The three vehicles look very similar, but surely each will have some unique design elements. Honda says that both the Clarity Electric and Clarity PHEV will make their worldwide debuts at the 2017 New York Auto Show next month. We'll be on hand for these debuts, so come the start of the show, live images will certainly be coming your way. Honda has officially released only a few details on the electric and plug-in hybrid versions of the Clarity. What we do know is that all versions are five seaters, unlike some of the other battery-electrics out there. Honda adds that the Clarity Electric will launch first, followed by the 50-state Clarity PHEV (with "an all-electric driving range rating in excess of 40 miles") at a later point in time. "The Clarity Electric will be the first affordable, midsize, five-passenger battery electric vehicle (BEV). The third vehicle in the Clarity series, the Clarity Plug-in Hybrid, will launch in all 50 states and will be the volume leader in the series, combining an all-electric driving range rating in excess of 40 miles with a hyper-efficient gasoline-hybrid extended range mode." TORRANCE, Calif. – The all-new Honda Clarity Plug-in Hybrid and Honda Clarity Electric will make their worldwide debut at the 2017 New York International Auto Show. 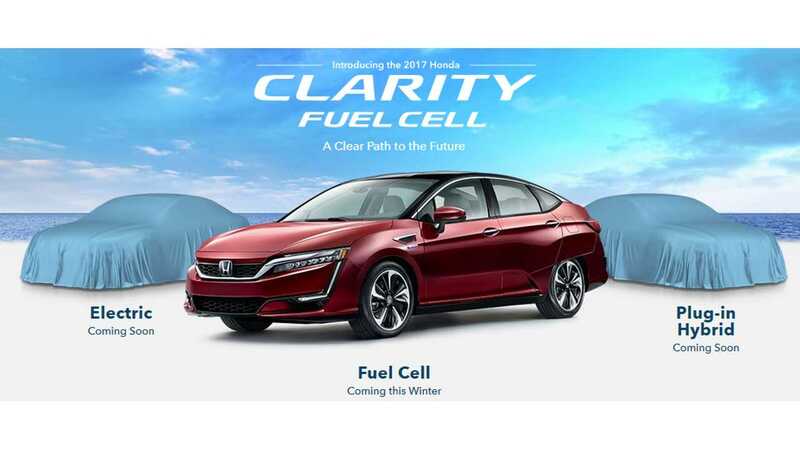 The two all-new, electrified Honda vehicles will make Clarity the first vehicle series to offer customers an expanded array of electrified vehicle choices with fuel cell, battery electric and plug-in hybrid powertrains wrapped in a sporty, spacious and comprehensively equipped five-passenger midsize sedan. The Clarity series is at the vanguard of Honda's commitment to address society's energy and environmental concerns as the company expects significant growth in sales of electrified vehicles. Honda has announced its intention to make two-thirds of its global auto sales from electrified vehicles by 2030. The official teaser sketch of the Clarity series released today includes the never-before-seen Clarity Plug-in Hybrid and Clarity Electric flanking the currently available Clarity Fuel Cell. As the next progression of Honda's dynamic styling for electrified products, each Clarity variant has a low, wide aerodynamic body with unique design elements. Combined with elegant and advanced exterior styling, the Clarity series boasts spacious interiors outfitted with premium, environmentally-responsible materials. Offering Honda "fun-to-drive" DNA, each Clarity variant provides a smooth, quiet and premium experience, with great dynamic handling plus seamless electric drive torque and acceleration. The Clarity series also features advanced technologies, including Display Audio with Android Auto™ and Apple CarPlay™, and standard Honda Sensing™ safety and driver-assistive technologies. The Clarity Electric will be the first affordable, midsize, five-passenger battery electric vehicle (BEV). The third vehicle in the Clarity series, the Clarity Plug-in Hybrid, will launch in all 50 states and will be the volume leader in the series, combining an all-electric driving range rating in excess of 40 miles with a hyper-efficient gasoline-hybrid extended range mode.